One size doesn't fit all: Solar Adventures & Saving Money - Win win win win! Our yearly electricity bill is ~AU$430, down from ~AU$754 in 2013. I was asked what have we done to drop this low? Sold a child? 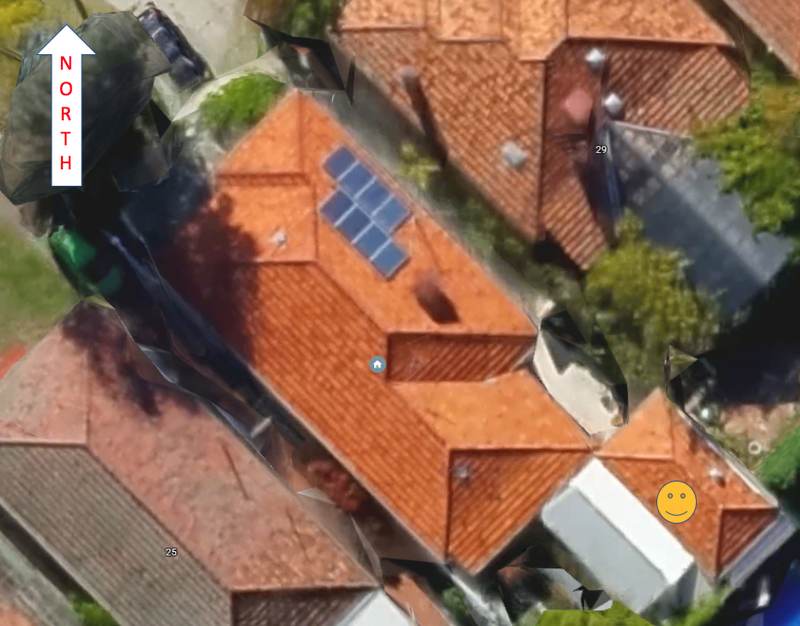 Installed a massive solar system and battery? To set context I live in a 1950s single story double brick tiled house in Perth Australia, what the British call a free standing bungalow I believe. My wife and my 2 kids under ten live in 3 bedrooms, 2 bathrooms, 1.5 living rooms and a separate office, approx 16m x 8m. The house is equipped with an evaporative airconditioner, natural gas for cooking, heating & hot water, with the exception of the oven which is electric. We have 2 TVs, 2 monitors, 3 laptops, lots of iphone/ipads, coffee machine, dish washer, clothes washer, fridge, microwave. Heating is a portable natural gas burner, we don't have a clothes dryer as Perth sun provides our drying needs. 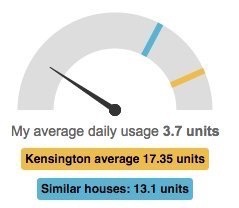 So what have we done to reduce use compared to our neighbours? I've taken a baby steps approach to slowly improving various parts of the house. We installed a 2.0kw solar about 3 years ago, it has a 2.2kw inverter, 2.0kw of panels, and at best peaks at 1.8kw during summer, about 1.3kw during winter. The 8x250kw panels face North East. In line with the solar, for things like clothes washing and the dish washer, we put them on a timer to run around lunchtime each day while we're at work & lunchtime sun means solar covers all the use. I do clean the solar panels, about every 3 months with a big squidgy mop. Perth summer air has lots of dust, and bees seem to like dropping pollen in big wads on the panels too which is easy to clean off with instant power boost. All of our lights were moved to fluorescents about 8 years ago, and now I've about 1/2 that are LEDs. Personally I'm finding LED lights way better than fluorescents which tended to blow frequently. LEDs have come down in price, and I keep an eye out for when they're on special too. We turn off phantom/standby powers use at the wall ... the tv equipment + laptops were big culprits and an easy fix. To make this easier I've provided powerpacks with individual power switches for each point so they are easier to reach rather than the powerpoints hiding behind cabinetry. We moved to a central iphone/ipad/usb/etc charger in the main living room rather than numerous powerpacks spread across the house which silently draw electricity and mostly weren't used for most of the day. With the one charger I can easily add and remove devices once they're charged without the family caring as long as they're charged. In turn my personal iphone & ipad are plugged in during the day for recharging, which takes me no effort at all. During winter we try to use a slow cooker during the day which takes further advantage of the available sun. During summer to control the house temperature I try and make use of relatively cold outside air in the morning to fill the house up, opening windows and doors to get cross breezes, and close it all down when the house equalizes to the outside temperature or a hot easterly starts blowing. With the evap aircon turning the fan and not the water pump helps to get cold air in the house quickly in the morning if need be. As Perth gets hot in summer (we hit 45C/113F last year), we do need to switch the evap aircon on properly during the day and late afternoon, but the goal is to cool the house with free cool air when I can. Overall the solar has definitely made a difference but it is on the smallish side. The incremental changes like moving the washing time, adding power efficient lighting has helped, and just identifying the standby power use I think is where the magic is. 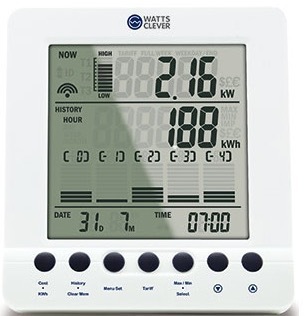 To help identify phantom power use we have the following live monitor attached to our house meter ... I find this particularly useful for just watching what's happening in the house to see if something has been left on accidentally, or something is misbehaving. 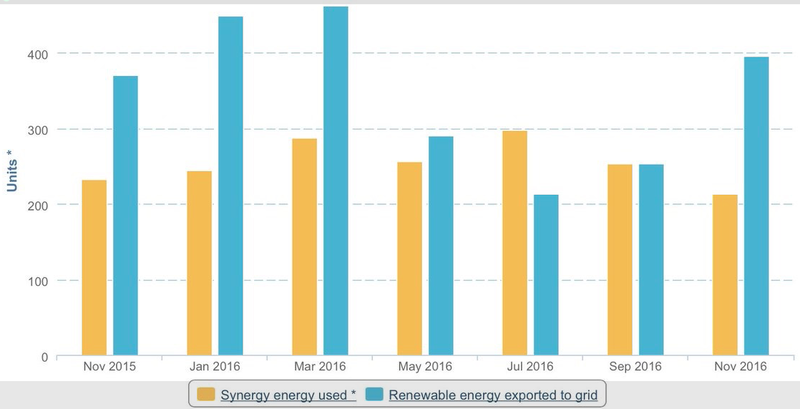 It only shows net use after solar is taken out, but that's fine as that when we're paying the grid and this is what I want to avoid. The main uses of electricity left when not offset by solar are things like the electric oven in the evening (my NE panels aren't good for offsetting this), the fridge which runs over the night, and the various electronics to a certain or lesser degree depending on what the kids are doing. Overall I think the main trick in achieving what I've done has been not to attempt to go gung-ho as not only can you easily suffer burn out but the family is likely to rebel. Instead I suggest incrementally improving the house, leaving an active note in your calendar every couple of months to remind yourself to revisit what you achieved and what you can do next. Besides the occasional disagreement about leaving the lights or TV on, mostly my family hasn't much noticed any difference (or they're very patient with me ;-). They still get to do what they want to do as far as I can tell. In terms of motivation, avoiding the ever increasing electricity charges is definitely part of it. 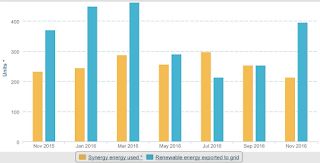 The local government raised electricity by ~3% this year again, and are signalling 7% increases the next two. Our house bills has dropped from AU$754.80 in 2013 before solar, to AU$395 in 2014, $445 in 2015 and $430 for 2016. Ideally I'd really like to see the yellow bar drop some more, I think I can shave about another 1/4. As the Australian federal government this year and for the next 15 years is now reducing the upfront solar rebate subsidy, I'm actively looking to max out our solar to 5kw. A battery may be in the future, but currently they are still expensive here, and I suspect my solar system isn't designed well for a battery anyway. Overall though, I'm particularly happy with the outcome to date. It hasn't been a strain on lifestyle, I feel like I'm sticking it to our government who can't get their renewable energy act together, I'm also helping tell the fossil fuel companies where to go, and finally I'm saving money too.